Social Farms & Gardens has scoured the corporate sector to find out what support is available to community growers, care farms and city farms from the business world. Take a look at the great opportunities we have found below and follow the instructions or links to take part or make an application. (Updated November 2018). Each month Waitrose stores choose three local good causes to support. Shoppers vote for their preferred cause by placing a token in a box on their way out of the store. Ask in your local store for further details. Voluntary organisations, charities, schools and pre-schools can apply for grants of up to £500 from the WHSmith Trust. 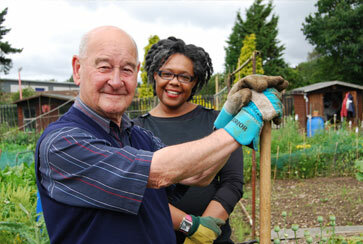 The Morrisons Foundation supports charities making a positive difference in local communities. Since launching in 2015 they’ve donated over £18m to help good causes across England, Scotland and Wales. Registered charities can apply to the DWF Foundation for small grants that develop and improve local communities in the areas of homelessness, health & wellbeing, education or employability. Offers grants and funding to small, grassroots charities and campaign groups that are working in the areas of animal protection, the environment and human rights. The majority of funding is allocated to smaller groups who struggle to find funding elsewhere. Funding raised by the carrier bag charge at Tesco stores is being used for grants to improve local parks, hold community events, support sports groups and more. Applications are assessed with the top three in each area going to a public in-store vote every month. A packaging company that sponsors the Green Flag Award. Their funding scheme is open to charities involved in environmental improvement or education and training - so perfect for community growing groups! If your mains supplier is Scottish and Southern Energy, or if they are undertaking work in your area, you may be able access their employee volunteering initiative 'Be The Difference'. Again this is through the completion of a simple form. Check to see if you fall within their coverage area by visiting their website. Santander's Discover Foundation offers grants and volunteers to community groups.Discovery Days mean employees from across the business can take part in team volunteering days where they’re based. These one-day events provide the perfect opportunity to help organisations in the local area. There is a £250 materials budget available and teams range from 6-20. TheJohn Lewis Golden Jubilee Trust is a secondment scheme that allows JL partners to spend up to six months fully paid working at a charity of their choice on a specific project where their skills can be used. Every store can donate unsellable products and materials for re-use by local schools, other educational institutions and community groups, for the benefit of the local community and the environment as part of their Community Reuse Scheme. Items are donated on the understanding that they will be re-used or disposed of responsibly if they are not used. The Screwfix Foundation funds projects that will fix, repair, maintain and improve properties and community facilities for those in need throughout the UK. Wessex Water are celebrating 25 years of their Watermark community giving programme by promoting the reduction of single use plastics. Projects run by community organisations, schools and parish councils located within the Wessex Water region are eligible to apply for small grants up to £1500 to provide local refill points to help people refill bottles from the tap instead of buying water or other drinks in plastic bottles that are thrown away after a single use. More information and contact details available online. Ford Britain Trust provides grants up to £3,000 for projects focusing on education, environment, children, the disabled, youth activities and projects that provide clear benefits to the local communities close to their UK locations. The Trust particularly encourages applications from Ford employees, but is open to all, provided that the qualifying organisations meet the selection criteria. Gives donations of up to £1,000 to local groups and charities in the UK, which have already raised vital funds themselves. Complete the short online form, explaining why your group or charity deserves a donation and how much you’ve already raised. Apply online. Matches teams of young professionals with high-performing and commercially minded charities to raise funds and address a business problem over six months. Only registered charities with at least two paid members of staff are eligible for the programme. Various waste management companies provide grants to community groups generated through the Landfill Communities Fund. Groups must be within a certain radius of a waste management facility to be eligible. Entrust provide an overview of the scheme throughout the UK. Companies distributing the fund vary in their eligibility, processes and criteria so visit websites for more information.